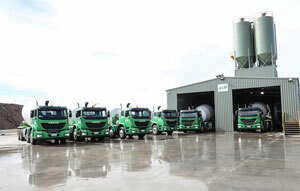 Concrete and construction products company ACM has opened a new batching plant in Rockbank, Melbourne, acquiring 10 new Iveco ACCO 8×4 agitators to service customers in the region. The new ACCOs are all equipped with 7.4m3 bowls and will service a range of customers across civil, residential and commercial sectors, according to ACM General Manager Digby Crawford. According to Iveco, Mr. Crawford did extensive research before choosing to purchase the ACCOs. “We looked closely at five different brand trucks all up, but in the end the ACCO had the best all-round package,” Mr. Crawford said. “The drivers are complimentary of the ACCOs, they drive well and in particular they mention that the ride is very smooth and comfortable,” Mr. Crawford said. “The Rockbank facility and the 10 new ACCO agitators are important components of ACM’s future growth and are helping us ‘Redefining Green’,” Mr. Crawford said.